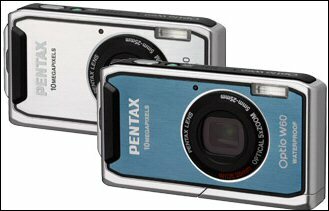 Pentax has launched a 10-megapixels Optio W60 waterproof digital camera priced at $329.95. Optio W60’s design is said to allow the camera to be operated in up to 13 feet underwater for two hours and at temperatures well below freezing. Besides the waterproof feature, the compact Optio W60 digital camera is dustproof against dirt, sand and dust, and comes with a 5X zoom lens with 28mm wide-angle capability. Optio W60 will ship in July 2008 in two colors – Ocean Blue and Silver.